What is the best brow shape for your face? Eyebrows accentuate your most important facial feature but they are not one size fits all. You may want the latest on fleek brow style rocked by Hollywood elite but this may not be the best option for your face. 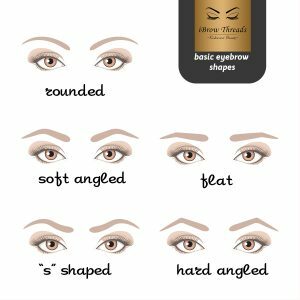 There are several factors that will influence the ideal angles for your brow but the most important factor when deciding on the perfect angles for your brow is your face shape. There are general rules of thumb that must be followed when deciding on the best shape. All our threaders are expertly trained to give you the best shaped brows for your individual face shape we follow all the rules to achieve your perfect shape. Here are the basics of what brows work best with which face shape. o Face is widest at the cheeks. o Forehead is wider than the chin. o Face tapers to a narrower chin. o Similar too oval yet chin is a prominent point. o The three sections of the face are equal length. Forehead, cheeks and chin. o Squared jaw is an obvious facial feature. o The three sections of the face are equal length. 5 basic eyebrow shapes. Various types of eyebrows. To compliment a curvy face, we will set hard angles into your brows. Hard angles will make the face appear longer. The perfect shape: Hard angled. You are the lucky ones. With this face shape you can pretty much guarantee any look will look good on you. With our oval face clients, we like to follow the natural arch of their brows and emphasise their natural arch. The perfect shape: Soft angled eyebrows. It may sound cute and easy but as heart shaped faced people would know it is incredibly difficult to shape the perfect brows for this face shape. A heart shaped face means the eye is already drawn to the top of the face, the forehead and eyes. We suggest soft angled low shaped arches. Also less is more when it comes to tinting you want to keep the look natural. To compliment vertical length, we focus on the horizontal. It doesn’t matter if your arches are strong, angular or flat we need to ensure length from left to right. With a square face we recommend you go thick and have a nice strong arch. Giving extra curve will soften the hard angles of the face. We also recommend darkening the brow to give your brows wow factor and draw the eyes away from the angular structure of the face and onto the eyes through the emphasis from the eyebrows.